Back in 2015, when nTopology Element was in pre-release beta, we faced a simple but important challenge. We had built a design environment that allowed engineers to use continuous 3D functions to make incredibly complex structures with just a few keystrokes. The question was: How should we display and work with those functions graphically? To meet this challenge, we developed a system of nested objects, with each level of hierarchy representing another function or transformation of the model. In nTopology Platform, we made these functions even more transparent — exposing all of their parameters and allowing each one to be recombined, reused, and shared extensively. When most engineers use nTopology for the first time, they see these functions laid out on the left hand side of the screen and think “that’s the feature tree.” But the reality is that our software thinks very differently about how geometry is created. The result is in an interface containing simple functions that enable much more powerful interactions. At nTopology, we think of design software as a functional programming environment. 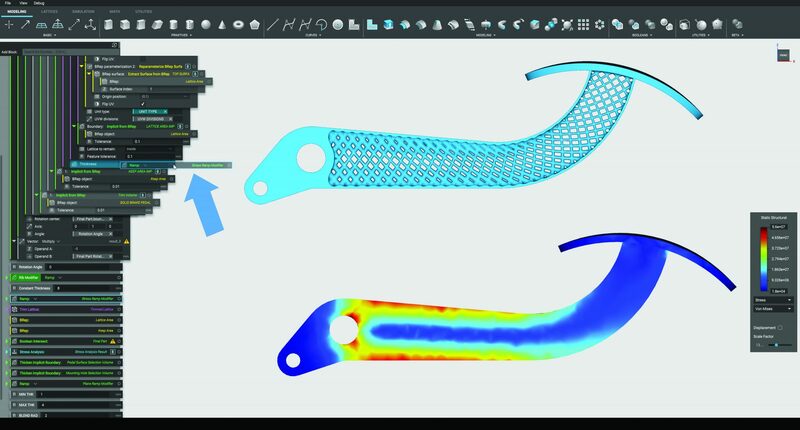 We let our users start wherever they want: primitive geometric shapes, native CAD geometry, output fields from finite element analysis, and more. Each of these inputs acts as a piece of high-level design intent; a parameter that can be passed into a geometric function. As parameters are passed into functions, blocks are created: Bits of geometric code that can be recombined to create highly complex designs. Blocks can be arranged recursively, one being used as the input to another. A concept model is passed into a patterning function; a block is spawned. It’s passed into an optimization function along with load case parameters; another block spawns. It’s passed into a toolpath generator along with process-specific manufacturing parameters; another block. A nTopology block controlling lattice thickness as a function of the yellow sphere’s distance field can be repurposed and used to drive an unrelated model. The inherent flexibility of the block system in nTop Platform is underpinned by the fact that although nTopology looks like traditional CAD software, it’s really a functional, visual programming environment that compiles design intent into highly tailored geometry. 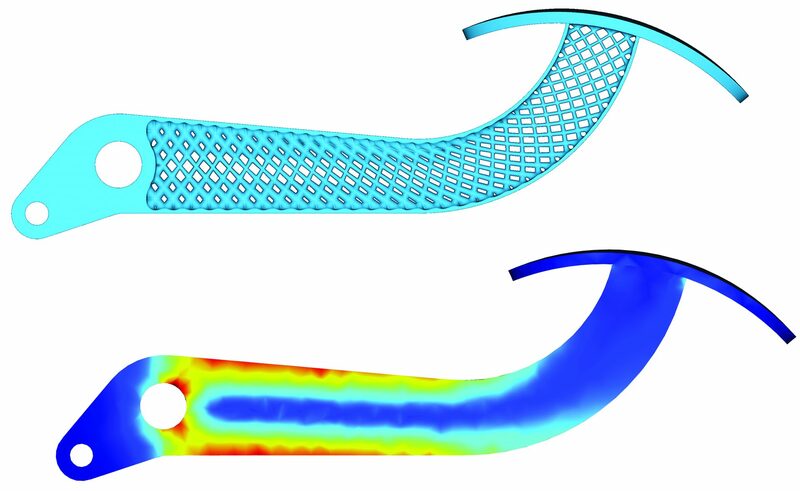 In traditional CAD, geometry is built up feature by feature – something that would be absurd to do if you were designing a heat exchanger with thousands of possible pathways. 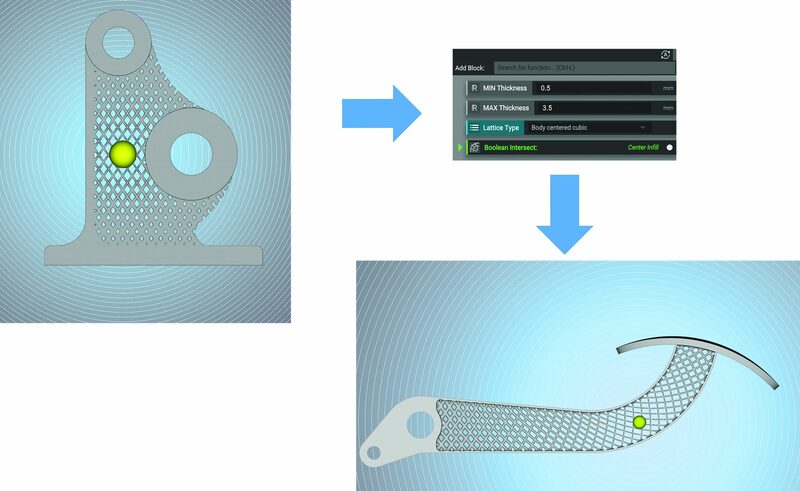 So in nTopology Platform, designs are based on 3D functions – volumetric data fields that can be used to drive the entire design at once. Because nTopology blocks are structured as 3d functions or operations, rather than geometric features, they’re able to be reused many times across a model and even shared across an organization. If one engineer finds an effective way of using CFD data to drive their part’s design, they can package up the workflow as a block and let others on the team benefit from the learned knowledge. In this way an nTopology file becomes a living, breathing document – an engineering notebook that can thread through whole families of valuable parts. For more on this topic and to see our block system in practice, we invite you to view our upcoming information session where we’ll explore nTopology Platform further enabling design for additive manufacturing. You’ll also see in this webinar how the implicit modeling technology behind nTop Platform enables the efficient transfer of data in the design process, reducing bottlenecks and spurring innovation. Spencer works primarily in metal 3D printing. 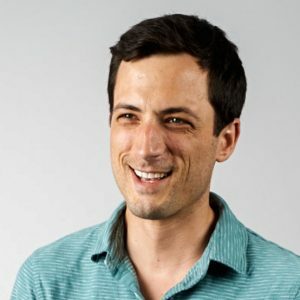 He's also done stints in consumer tech, residential robotics, management consulting, and construction project management - and he's probably the most award-winning whistler (no joke) you'll ever meet. nTop Platform is helping companies realize products with Additive Manufacturing by integrating the Design for Additive Manufacturing (DfAM) workflow and removing inherent barriers to iterative redesign necessary to create breakthrough new products.